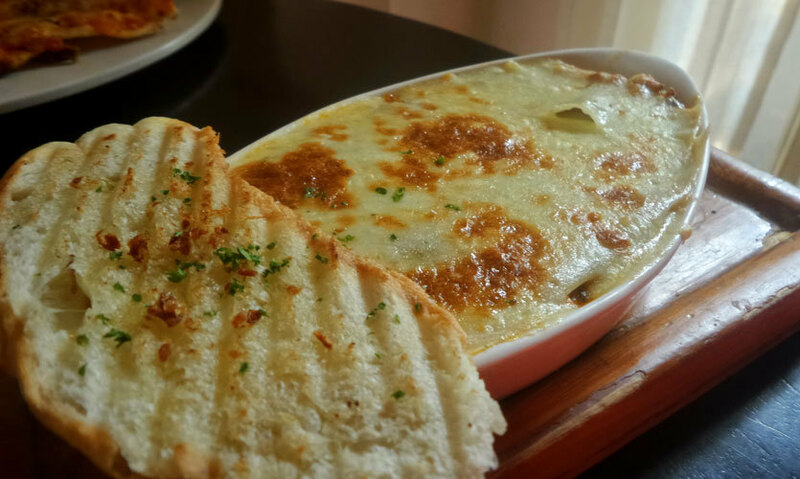 #FoodReview - Here's Why The Newbie Cafeteria & Co. Gives Seasoned Favs A Run For Their Money! Figuratively the jewellery house of restaurants and cafes, Hudson Lane seems to be one place Delhiites can&apos;t get enough of. From the people running QD&apos;s and Rico&apos;s comes another delectable casual dining restaurant that has been wooing people around town. We got ourselves a brunch date with Cafeteria and Co. and we’re here to take you through it! As soon as you enter, the place strikes you as being very tastefully done and airy. The unique decor captures your attention with the mish-mash of colours that compliment each other very well. We arrived fairly early and the place went from two tables to full capacity in about less than an hour. The menu seemed very interesting with many Mexican undertones and we couldn’t help ourselves from ordering a feast! The dish was made of tender chicken cooked in a dense gravy full of vegetables. It had a nice smoky flavour that made us reach out for more. The top was covered with cheese that balanced the smokiness perfectly. You could taste chicken in every bite so even the quantity of the star of the dish was significant. A good start indeed. 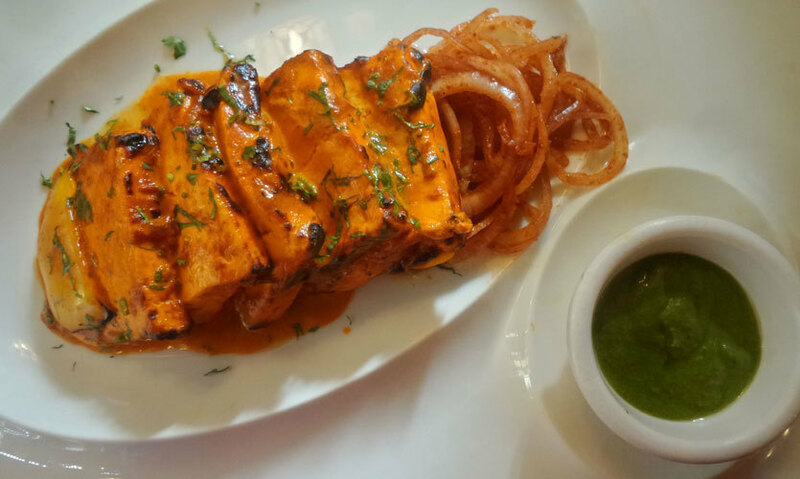 If you imagine almost burnt cubes of paneer served with thick vegetables when you think of Paneer Tikka, this fusion offering is about to surprise you! Nicely charred paneer blocks separated sequentially by all three colours of bell peppers, this dish had hints of Peri Peri while maintaining the essential Punjabi taste. The spicy onion salad and tangy pudina chutney added a good variation too. Brownie points for the thoughtful plating! 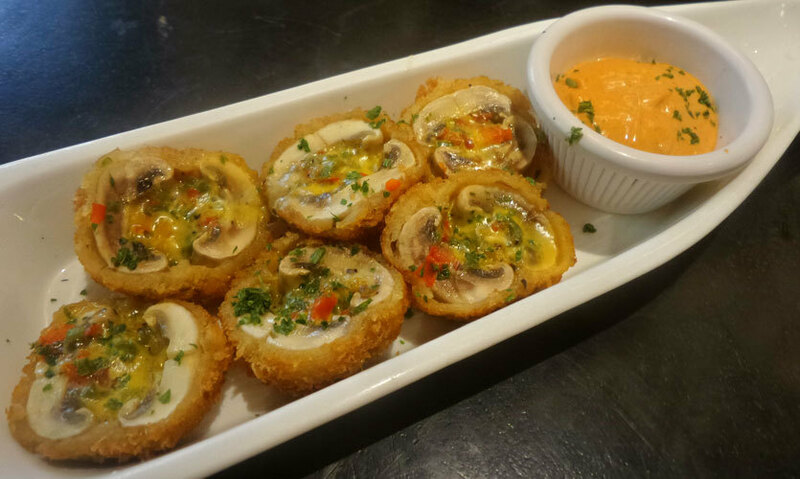 Mushrooms are a thing that people either love or hate, but this mushroom centered dish will be appreciated by all! A stuffing of vegetables inside mushrooms coated and served with some deep fried goodness, the sauce made the dish memorable as it had a very striking yet likable flavour to it. The quantity seamed less when compared to the other starters but that was the only bone we could find in this fish! Following their mantra of doing things differently, the perfectly hexagon shaped pizza didn’t fail to leave a mark. The base was on the thinner side but still didn’t have that rock hard side crust that thin crust pizzas usually do. 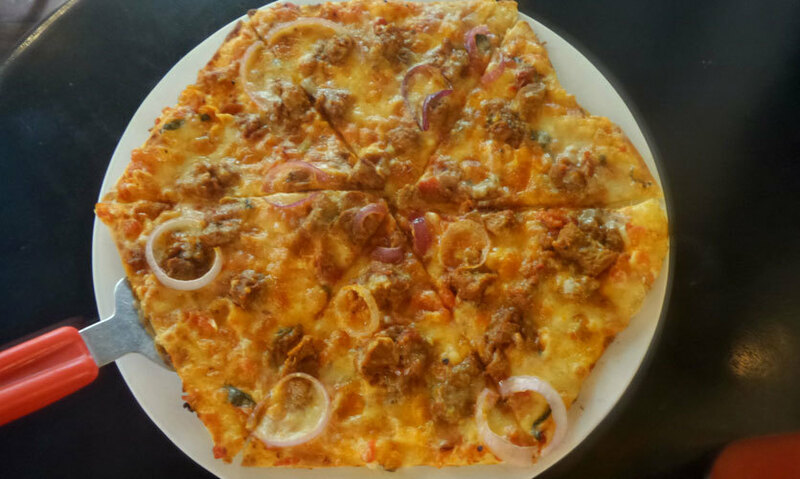 Judiciously laden with smoky mutton chunks, the pizza was quite filling. The spices were nice and had Mexican flavours too. Overall we felt it needed some more vegetables to counter the redundancy that comes with the size and amount of mutton. A unique starry burger served in an apple shaped plate gives the good ol’ burger a peppy makeover. 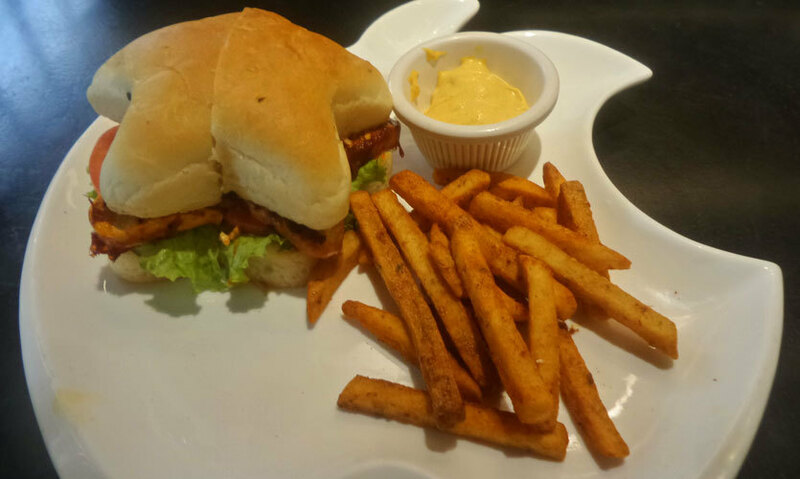 It was actually a paneer based burger served with spicy fries and another stellar sauce. The fries were crunchy and tasty, the patty was similar to the Peri Peri Paneer Tikka but became a little bland like every other paneer burger after a few bites without the sauce. The presentation was truly the star of this dish! To counter all the heaviness that came from gorging on the dishes, these two beverages were a refreshing change. 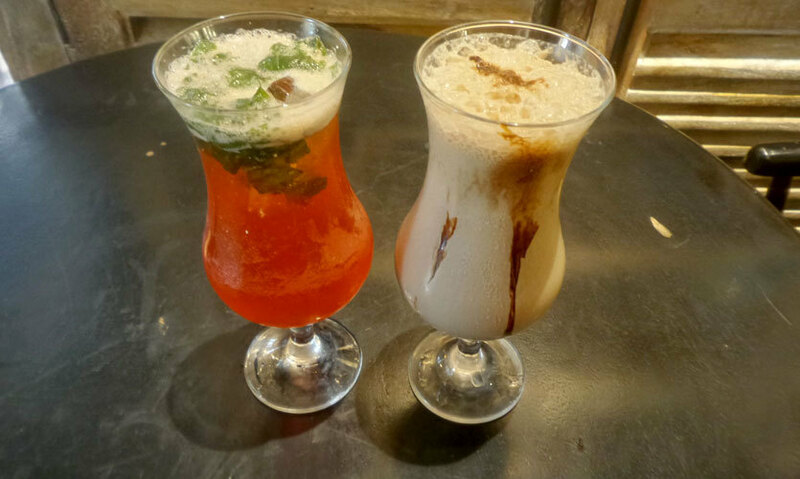 The Paan and Basil flavoured Iced Tea is a perfect summer cooler that should be tried. The Tiramisu Shake had a thick consistency and a delightful flavour - it definitely can’t be missed! Cafeteria & Co. offers a range of crepe options including mixed berries, banana, nutella and chocolate roll ups. Combining two beloved delicacies i.e. Tiramisu and Crepe resulted in this heavenly dessert. 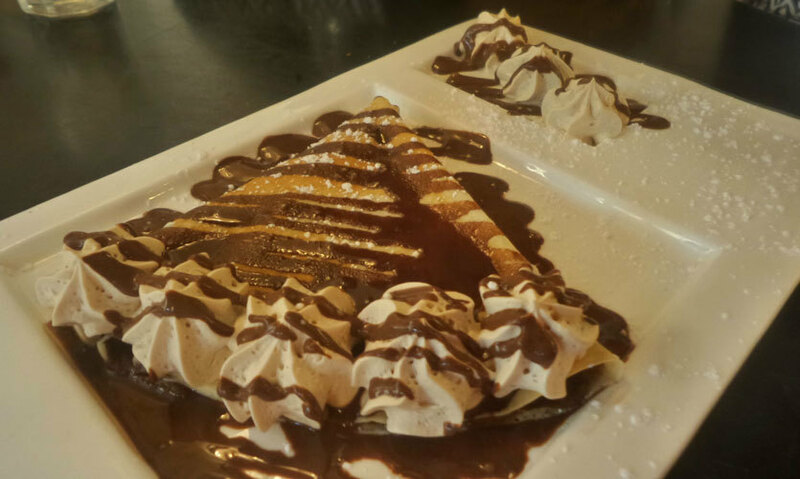 Amazingly thin crepes with tiramisu flavoured cream topping sprinkled with powdered sugar and chocolate - the dessert was a vision to behold! Don’t miss out on this gem. Very scarcely do you find a place that provides good food, an even better ambience, and the right kinda vibes. Cafeteria & Co. hits the sweet spot in all these categories making it a favourite in the area! This new kid on the block is definitely running for glory and will be giving seasoned favorites a tough fight - go check it out for yourselves!